We know Pilates is an ideal environment to create a more balanced mind and body. By embracing the principles of Pilates and committing to your practice regularly the benefits are amazing. One of the things I love about Pilates is the ability it has to create a deeper awareness about the body, to help with posture and build a deeper level of strength that incorporates the principles of mobility and stability. Pilates allows us to work the body in all ranges of movement whilst remaining focussed around our centre – our core! What are the results – a stronger, more alert, connected, balanced mind and body. Pilates is the perfect benchmark to work from in pursuit of any fitness goals. It builds a strong foundation for movement and exercise. One of the most talked about topics around the fitness industry at the moment is the need to find a more balanced approach towards gaining strength and exercising. Unfortunately the 28 day challenges offered in the marketplace really only challenge your mind and your commitment potential. 28 days is not enough time to create long lasting physical results, this is simply not possible or sustainable. As they say, there is no such thing as a quick fix, and the best results come from a more realistic commitment approach that is consistent with how the body adapts and changes. Our body needs time to adapt, strengthen, lengthen and change and we all do this at different rates. Challenge is key, doing the same thing over and over again will not reap the same rewards after a period of time, hence why our goal is always to challenge and progress our clients at appropriate levels. And, yes we need a strong core, but we also need our bigger muscles to be strong, these are the muscles that help us climb stairs, go for a run, lift heavy bags of shopping, carry our grandkids and even down to getting in and out of a bath as we get older. Seems simple but often we can be performing well in one area but lacking in others, as they are inter-related they will impact each other. For example if you are exercising 4 days a week but eating poorly and sleeping poorly the results you receive from exercise will be less noticeable than if you had all three under control. What we may also not understand is that putting high levels of load in to a body that is malnourished and lacking energy will have way less an impact on muscle strength, weight loss and overall tone and adaptability of the body. The key is balance, knowing when and how much to exercise and how much challenge your body requires. Finding the perfect recipe for each of you is my goal. I believe Core Pilates offers an exceptional Pilates service that is true to our vision of empowering people with the knowledge and skills to learn how to move well and find a love for moving often. Pilates will and should always be at the core of our work, but I am also excited to bring some new elements in to the studio by offering strength and conditioning sessions along with mindfulness and meditation. So, lets take Pilates and find some extra challenge and power by adding strength & conditioning. 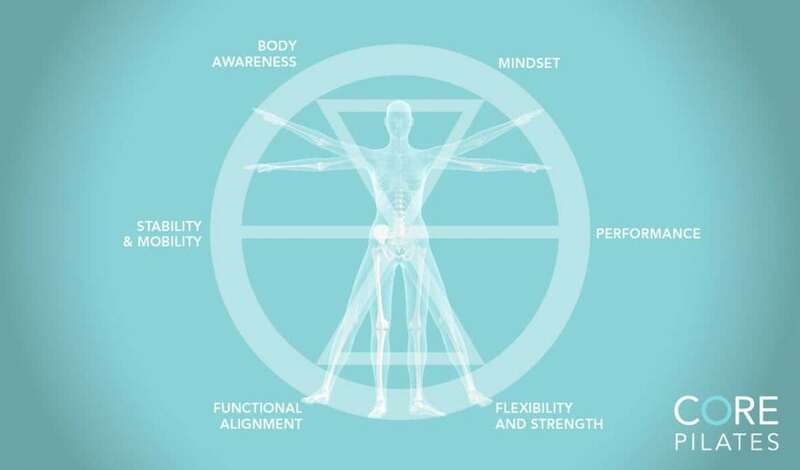 Having body awareness, core strength and posture control are key elements for a successful strength program, all of which we can and already do create for people through their Pilates sessions. What strength training brings is another way to challenge your body and we can do this in a safe, small group environment just like your studio sessions. Not only is this a good way to build muscle strength and power but also an ideal way to maintain strong healthy bones, particularly for women over 40. As of the 10th September we will be offering Strength & Conditioning sessions to our timetable. We will be welcoming Sarah Murphy to our team. Sarah has 7 years Personal Training experience and has built a wonderful reputation working with a wide range of clients and I am positive she will fit in to our family really well. Sarah will be teaching small group strength sessions in the early mornings through to 10am. She will be available Tuesdays, Wednesdays and Thursdays. I am also incredibly blessed to have both Luisa and Lisia who are qualified in both Personal Training and Pilates, so look out for our new mixed classes called Power Pilates. These classes are designed to give you a solid workout that incorporates the mat, reformer and weights. Our packages have been designed to use across both Pilates and Strength classes so there is no excuse not to give something new a go and mix things up, or add an extra class and try something new. We have also recently introduced meditation to the studio and this has proven to be very popular. We will be continuing to offer 6 week courses moving forward so if you are keen to give it a go keep an eye on the schedule. We are here to help you be the very best you can be, by offering a safe, caring and positive environment. My goal for Core Pilates is to teach each of our valued clients how and why we should be moving our bodies and why it is important to nurture our minds. Most importantly we want to have fun, find enjoyment in staying healthy and help you reap the rewards of living a healthy and happy life. Please chat to us if you would like to find out more.